Repair broken Inverters, charge controllers and UPS in Nigeria Repair broken Inverters, charge controllers and UPS in Nigeria — Wavetra Energy LTD.
You can now fix your faulty Inverters, solar charge controllers, UPS and related electronics in Nigeria at Wavetra Energy store. This is a great development and our way of offsetting the already significant cost of installing a complete solar/Inverter system. So your old broken stuff can be transformed into a new one other than purchasing a new unit. We repair all kinds and models of power inverters, UPS and charge controllers which includes Lumininous Inverters, Sukam Inverters, Magnum Inverters, Xantra Inverters, Xantrex Inverters, Microtek Inverters, Prag Inverters, Powerstar Inverters, SMA Inverters, etc. 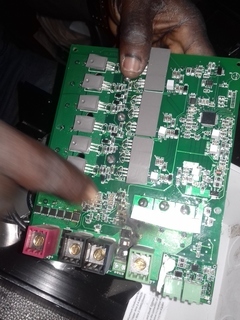 You no longer have to discard your faulty Inverter, charge controller and UPS as we can fix the faulty components and restore the item back to the state you bought it or even better. We have assembled a team of engineers and expert with the average of 5 years’ experience in Inverter and electronics repair. This team is headed by a foreign expatriate and yet the charge is very affordable from as low a N2,000.00 Delivery: We also provide delivery service to our esteemed clients. So you can choose to pick up your faulty system or let our delivery team deliver it to your preferred location. What to do: Its simple. You can use our contact form to get in touch with and let us know the item you want us to fix. Someone from our office will get in touch with you within 24 hours. We can also pick up the faulty item from your location, repair it and deliver it to you all at a very affordable rate and little stress.